Obstructive sleep apnea is a serious sleep disorder marked by interruptions and pauses in breathing during sleep in children and adults. This means the brain and the rest of the body may not get enough oxygen. Sleep apnea often goes undiagnosed. Doctors usually can't detect the condition during routine office visits. Also, no blood test can help diagnose it. Most people who have sleep apnea don't know they have it because it only occurs during sleep. A family member or bed partner might be the first to notice signs of sleep apnea. Untreated sleep apnea can contribute to several serious health conditions, including: heart disease, stroke and liver problems. 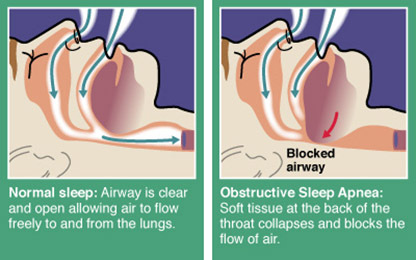 Sleep apnea treatment is dependent on the severity of the condition. If you suffer from mild to moderate obstructive sleep apnea, our orthodontist, may recommend an Oral Sleep Appliance (OSA). 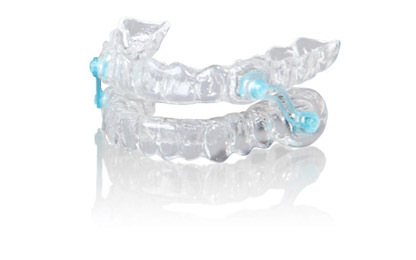 Oral Sleep Appliances are devices worn in the mouth while you sleep, similar to orthodontic retainers or mouthguards. They are comfortable, easy to wear and can be effective immediately. The dental appliance is designed to advance the lower jaw and keep air flowing. This repositioning of the jaw helps prevent collapse and blockage of the airway. Fitting and making a custom appliance takes approximately 2-3 weeks. Yes. Most medical insurance companies cover oral appliance therapy for treatment of Obstructive Sleep Apnea (OSA). However, insurance companies generally do not cover treatment for snoring only. The most common treatment is Continuous Positive Air Pressure. CPAP keeps your airway open by providing a steady stream of air through a tube connected to a mask that you wear as you sleep. Another option is surgery performed by an American Academy of Dental Sleep Medicine member trained as an oral and maxillofacial surgeon. A surgeon can prevent airway collapses by eliminating tissue in the soft palate, uvula and tongue. More complex surgical procedures can reposition the anatomic structure of your mouth and facial bones.